A secure and private cloud docker registry for all that includes 20 private repos - free! Find out more! A private dedicated single-tenant docker registry for teams who require collaboration, permissions - with 30 private repos - free! Find out more! 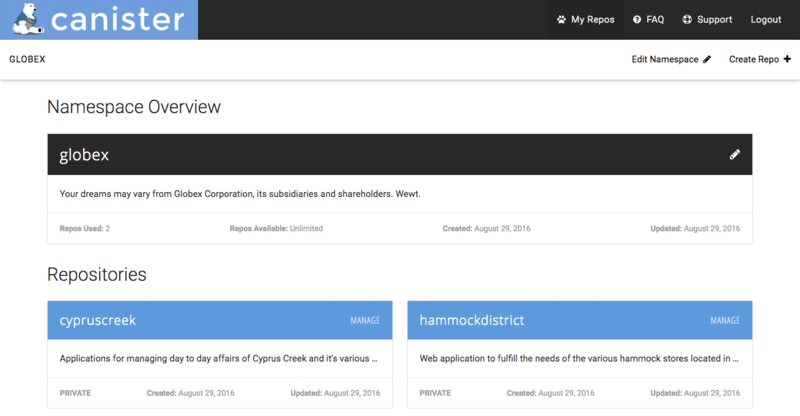 Canister Cloud and Dedicated registries have a web platform that's fast, easy, and intuitive. Full walkthrough coming soon! 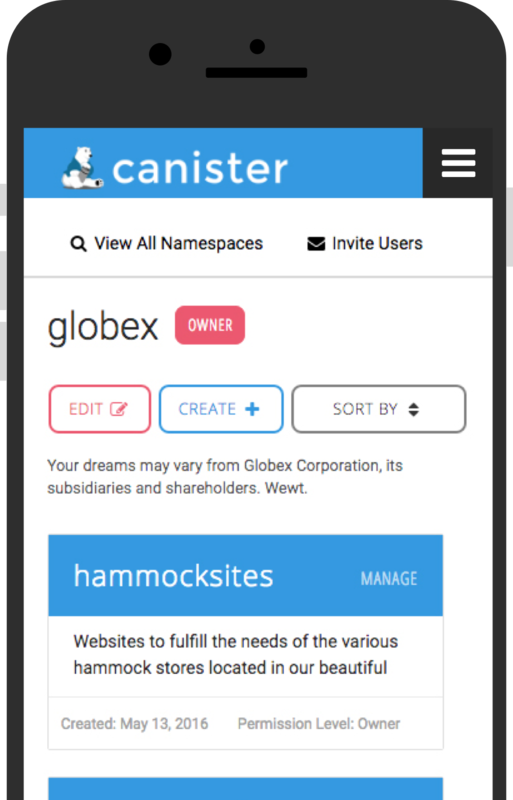 Extend the functionality of Docker registries with the canister.io API to manage your team and images. Read the docs. Extend the Docker CLI to simplify interaction and pull details on tags, events and permissions. - Coming soon. Use the Docker CLI to pull and push images or use the Canister CLI and save yourself some typing. Docker documentation. Canister registries are compatible with most services that support Docker container registries like, Docker Hub, Cloud/Trusted Registry and Quay - Contact us with questions! Use Docker v2 Registry API's to store and retrieve Docker images secured with canister.io. Docker documentation. A dedicated, single-tenant container registry backed by dedicated hardware resources for multiple users. Create namespaces for specific projects, groups, or however you want, manage permissions, build an easy workflow. Free for the first two users, reasonably priced for more. We scale your registry's resources as your team grows. A multi-tenant Cloud service for individuals and developers who are just getting their feet wet with containers and need a place to store and build their own images, privately. Unlike other services, we offer enough free private repositories to guide you through learning and experimenting without having to incur another monthly cost. Docker Container Registries for Developers and Teams.